When Displayed over a street, the flag should be hung vertically with the union to the north or east. 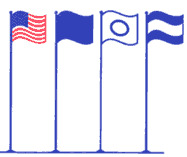 When a number of flags of states, localities, or societies are grouped for display, the flag of the United States should be positioned at the center and highest point of the group. When flown with flags of states, communities, or societies on separate flag poles which are of the same height and in a straight line, the flag of the United States is positioned to it own right. The other flags may be smaller but none may be larger or positioned higher than the flag of the United States. The flag of the United States is always the first flag raised and the last to be lowered. When displayed against a wall vertically or horizontally, the flag's union (stars) should be to the top, to the flags own right. When displayed from the same flagpole with another flag of a state, community or society, the flag of the United States must always be at the top. Only the church pennant may be flown above the flad during church services for Navy personnel when conducted by a Naval chaplain on a ship at sea. When displayed a staff projecting from a window, balcony, or a building, the flags union should be at the peak of the staff unless the flag is flown at half staff. When on display, the flag of the United States is always positioned to its own right. It should be placed to the right of the speaker, staging area or any other flags in the immediate area. The flag should never be used as drapery, or for covering a speaker's desk, draping a platform, or for any decoration in general. Bunting of blue, white and red stripes is available for these purposes. The blue stripe of the bunting should be on top. The flag should never be used for any advertising purpose. It should not be embroidered, printed or otherwise impressed on such article as cushions, handkerchiefs, napkins, boxes, or anything intended to be discarded after temporary use. Advertising signs should not be attached to the staff or halyard. The flag should not be used as a part of a costume or athletic uniform, except that a flag patch may be used on the uniform or military personal, firemen, policemen, and members of patriotic organizations. The flag should never have placed on it, or attached to it, any mark insignia, letter, work, number, figure, or drawing of any kind.